What is possible when teachers of all writers “focus on their students’ potential achievement through scaffolded support, rather than on their current levels of achievement in English?” (Pauline Gibbons) California Writing Project Teacher Consultants developed this series of iBooks to show how they are applying the new California ELD and Common Core State Standards (CCSS) to lesson development, instruction, and assessment in specific English learner contexts. 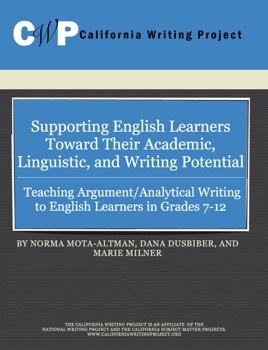 This iBook focuses on supporting teachers of college-prep courses whose students include redesignated, accelerated, or long-term English learners and also secondary ELD or designated ELD teachers. Helping teachers understand how to teach and assess writing by using the ELD standards in concert with the CCSS seemed to this team of teachers to be one of the best ways to illustrate their teaching and learning in progress, while illuminating the possibility and potential of their English learners.